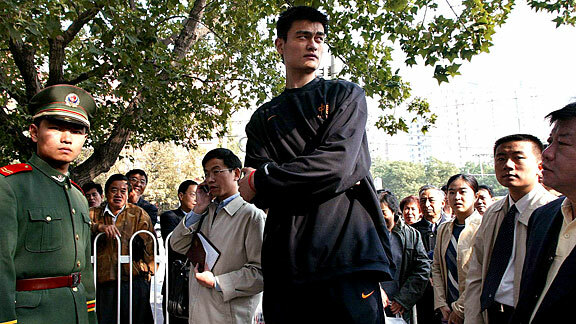 Yao Ming's NBA journey began in line outside the U.S. consulate, hoping for a visa. I had grown up a huge NBA fan, so at first just being around these people was a kick in and of itself. I was freelancing for all kinds of different outlets, but even though it didn't pay the best, I gave the NBA work precedence, simply because I loved it. But after a couple of years hanging around locker rooms, my relationship with the NBA had changed. Like most fans, I guess, I had projected that these players I loved must be fabulous people who would be fun as hell to hang around with. That, I realized, had been naive. It's a little different now, to be honest. But then, players were pretty aloof (Furs! Bentleys! Attitude!) and reporters were pretty annoying, and in that bitterness, there was shocking little genuine communication, at least when a newbie like me was hanging around. I'd go to games and practices with a nose for the truth and come home with a tape recorder full of platitudes, often dipped in disdain. A few years in, I got a big assignment: to join the Houston Rockets on the road, to write a magazine cover story about their rookie sensation, Yao Ming. Yao was among the most famous and recognizable people on the planet. He was also from the other side of the world and, then, not much of an English speaker. My expectations were high that I'd write something that would sell magazines, but low that this would be the interview in which I felt I got a uniquely deep look into a player's real personality. Even though it was early in his NBA career, he had every reason to be short with people -- there weren't enough hours in the day to be any other way. Just his walking through a hotel lobby on a sleepy San Antonio afternoon required real-deal crowd control. I saw a middle-aged woman at a dead sprint across the courtyard, merely to join the throng watching him get his hotel room key. If he had signed every autograph, posed for every picture and answered every question, he'd still be in the lobby of that Riverwalk hotel in San Antonio right now. When, at long last, he reached his hotel room, I was granted an interview with Yao and his then-ever-present translator, Colin Pine. Maybe I was there an hour or two, but however long it was, it was long enough to "cut the crap." Five minutes would have been long enough, in fact. The whole massive entity of Yao was infused with sincerity, humility, fun and warmth of spirit -- the things I guess most people imagine they would find in the celebrities. He rattled off all kinds of truths, for instance that he wasn't anything like his listed 7-foot-6. Without shoes, he said, he was 7-3. Photos would show Shawn Bradley -- listed at the same height -- was taller. Why did they list him at 7-6 then? He cocked an eyebrow in a "you tell me" kind of way. This was a guy who had been a pawn in a much bigger game for a long time. And though he had a certain role to play as a basketball player, he was telling the truth, even as it didn't serve his image. Refreshing. Eventually, he started asking me questions, and most of them were about Shaquille O'Neal. The Rockets had just come from playing the Lakers, and O'Neal had gone to some trouble to intimidate Yao through the media and on the court. It didn't sit well with Yao -- not that O'Neal would use his mouth to gain an advantage, but that O'Neal was putting on such an act. A smiley guy such as Shaq couldn't really be that crass, right? Yao wanted something a lot of people wanted: help making sense of Shaq. He allowed that his childhood had not been all that fun, and that the training hours were incredibly long and the free time incredibly short. And he had no other option. But imagine if somebody had essentially stolen your childhood. You'd be angry, right? Not Yao. He was too stoic, too tough, too focused on the present and the future. Too pragmatic, too sincere. Too capable of making friends with Colin, of laughingly teasing teammates such as Moochie Norris and Bostjan Nachbar. Yao Ming was where he was and he wasn't going to cry about that or anything else. Eight-and-a-half years later, how funny is it that O'Neal is leading the charge in wishing Yao well, calling him one of the greatest ever and even inviting him to share a vacation. Yao had been right about O'Neal all along ... the two had buddy potential. And now that word is injuries have robbed Yao of the second half of his career, much as an obligation to his country robbed him of much of his childhood, it's easy to feel bad for Yao. But it's also easy to predict plenty of sincere happiness for him. He has a delightful and refreshing gift for connecting with people, for finding the good. He has faced big challenges, such as the loss of a childhood -- or Shaquille O'Neal, for that matter -- with a smile. Hard to believe he won't be able to handle retirement -- he has handled far tougher.